In the mid-1980s, Jim decided to create a Swedish Chef themed breakfast cereal parody. Potential names included Oople-Sauceys, Croonchy Poofs, Moopettes, and the favorite (among the Henson people, not the manufacturer) Stoopid Flakes. 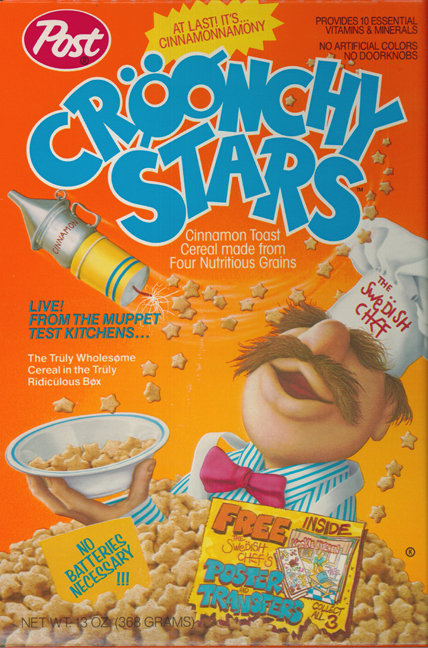 With major contributions from art director Michael Frith, the idea evolved into a real product from Post Cereal called Croonchy Stars which landed in grocery stores in late 1988. 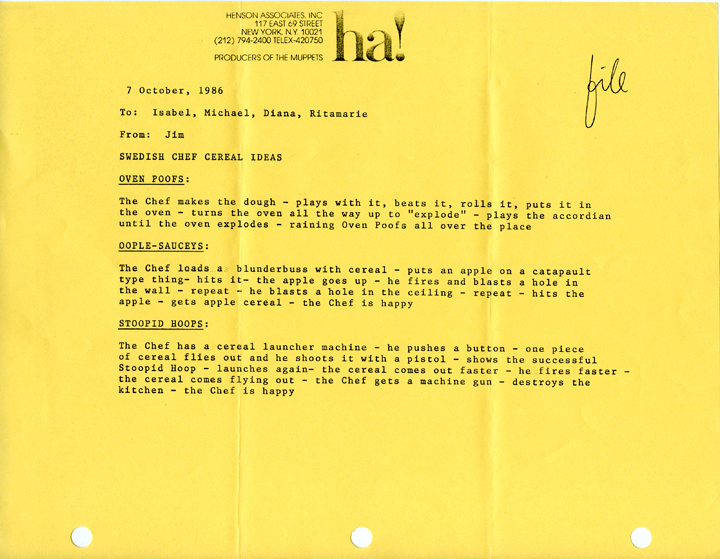 The commercial shoot in 1987 was for the earlier Stoopid Flakes version of the cereal, and a new commercial was taped for the final version the following spring. Croonchy Stars Cereal box designed by Michael Frith. 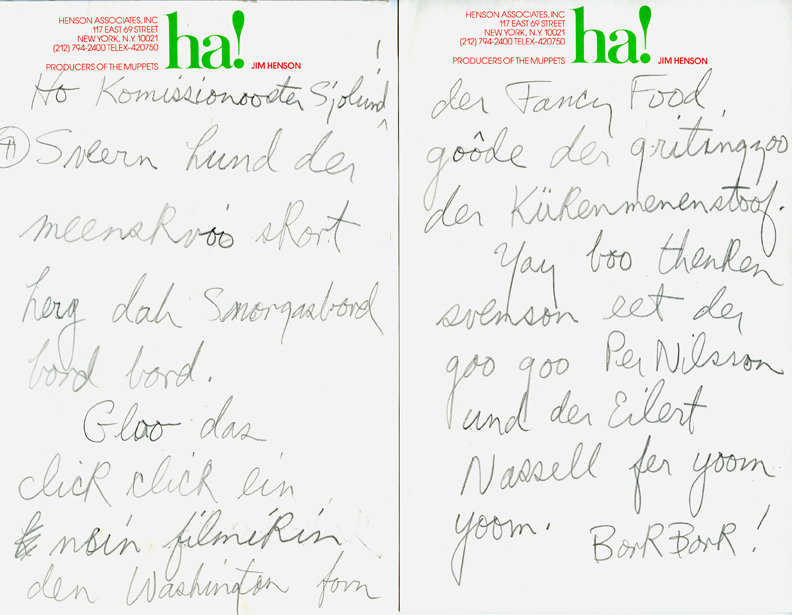 Jim’s draft of a letter from The Swedish Chef to the Swedish Trade Office in response to their request for his appearance at the 1983 International Fancy Food and Confection Show in Washington. 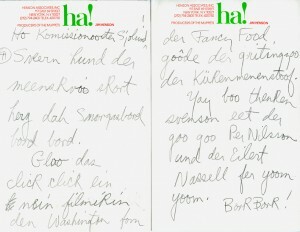 Jim’s ideas for various versions of a Swedish Chef cereal commercial. 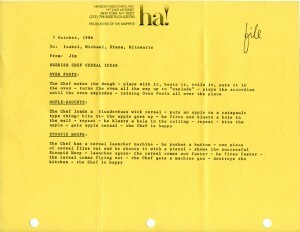 This entry was posted in 11-November '87, 1987, Commercials and tagged cereal, Frith, Juhl, Muppets, Oz, Post, Swedish Chef. Bookmark the permalink.